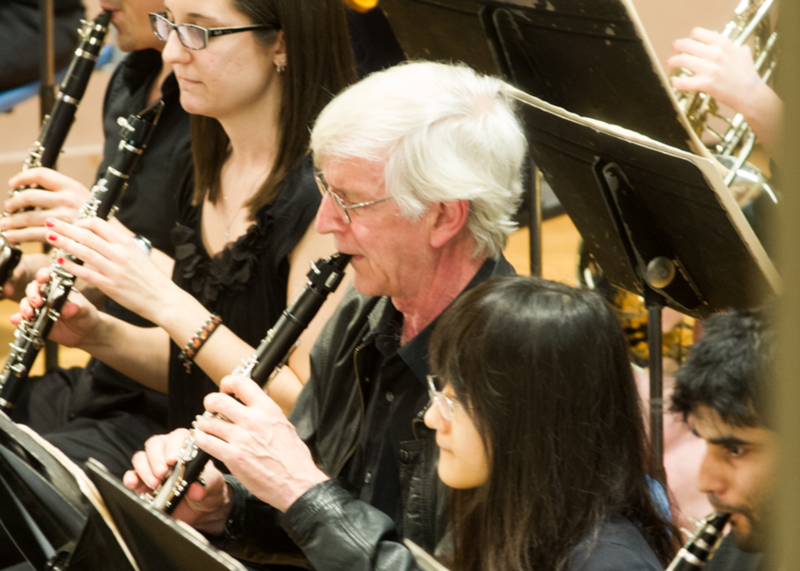 Roger Hendrix was a Professor of Biological Sciences at Pitt and a bulwark of the University of Pittsburgh Symphony Orchestra’s clarinet section until his death in 2017. On December 5, the UPSO will premiere a clarinet concerto, A Conversation with Memory, composed in honor of Professor Hendrix by his brother-in-law and accomplished composer Daniel S. Godfrey. Below is Godfrey’s description of the work, his reflection on composing it, and on Roger himself. A Conversation with Memory will feature faculty member Mary Beth Malek on clarinet on a program that also includes Brahms’s Symphony no. 4, and Tchaikovsky’s Romeo and Juliet. The free concert takes place on Wednesday, December 5 at 8 p.m. in Bellefield Hall Auditorium. The dedication for A Conversation with Memory reads “Commissioned by the University of Pittsburgh Symphony Orchestra to honor the memory of Roger W. Hendrix, Distinguished Professor of Biological Sciences (and clarinetist extraordinaire).” When Roger Zahab, conductor of the orchestra, reached out to me about a piece to honor my brother-in-law, Roger Hendrix, many possibilities occurred to me at once. The easiest one to settle on was to write a concertino (c. ten minutes) for clarinet and orchestra, an acknowledgement of the many hours Roger and I had spent together over the decades reading our way through works for (or transcribed for) clarinet and piano, Roger eloquently on clarinet, I ham-handedly at the keyboard. Finding the right affect, the right “tone,” for the work was more of a struggle. Should I devise a clever way to reflect Roger’s deep, almost child-like inquisitiveness about everything he encountered—from the natural environment, to the many global destinations he and my sister Susan visited, to the construction of a musical work, to the construction of a new camera he was trying out, to the construction of a newly-acquired krummhorn? Should I play upon Roger’s ingenious and notoriously goofy sense of humor, even deployed at times to explain complex biological phenomena? (Famously: “All the world’s a phage!”) Other composers are better than I am at weaving such varied conceits into their music; with my own work, the eclectic has usually felt artificial. Daniel S. Godfrey (b. 1949) has earned awards and commissions from the J. S. Guggenheim Memorial Foundation, the American Academy of Arts and Letters, the Fromm Music Foundation, the Rockefeller Foundation, the Bogliasco Foundation, the Koussevitzky Music Foundation, and the Barlow Endowment for Music Composition, among many others. His music has been performed by soloists, chamber ensembles and orchestras throughout the U.S. and abroad. He is founder and co-director of the Seal Bay Festival of American Chamber Music (on the Maine coast) and is co-author of Music Since 1945, published by Schirmer Books. Godfrey’s works are recorded on Albany, Bridge, CRI, GM, Innova, Klavier, Koch, and Mark compact disks. His music is available through publishers Carl Fischer and G. Schirmer. Godfrey received his graduate degrees in composition from Yale University and the University of Iowa. He is Professor and Chair in of Department of Music at Northeastern University’s College of Arts, Media and Design in Boston, Massachusetts. Prior to his recent appointment at Northeastern, Godfrey was Professor of Music Composition, Theory and History at Syracuse University’s Setnor School of Music. He has also held guest faculty appointments in composition at the Eastman School of Music and the Indiana University School of Music, and he taught from 1981-1983 in the music department at the University of Pittsburgh.